So I’ve finally got Gmail’s Insert Files using Drive feature, which lets you attach files from your Google Drive into mails. Drive gives you 5GB of cloud storage for free, so now you can attach files with size up to 5GB. Earlier the maximum size of an attachment was 25MB. To check if you’ve got the feature by now, click on Compose and see if there’s a Drive icon in the toolbar. 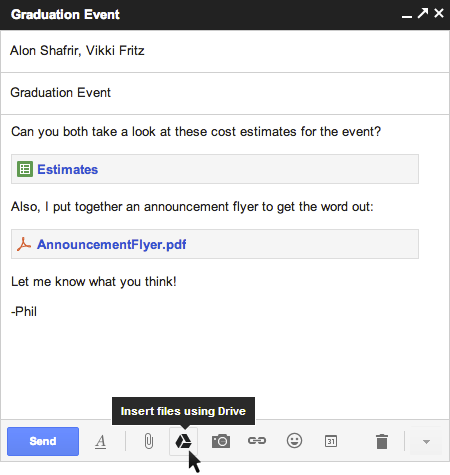 This is much easier than uploading to somewhere else, like Dropbox, and emailing the link, since you can do everything within Gmail. Still, I’m in favor of Dropbox for cloud storage. Drive is just for attachments and Google Docs. If you haven’t activated 2-step verification for Google / Gmail already, it’s high time you did. 2-step verification essentially requires you to provide two proofs to show that you are actually you. After getting the password correct, you’ll get an SMS with a verification code which you have to enter to sign in. In case the phone is lost, no cellular coverage, etc you can add recovery options. Why bother? Because you never know when your account’s gonna get compromised, and when you do, you’d wish you were dead.